A gunshot took the life of 27-year-old Genna Ayup more than six years ago. But only this Wednesday did her boyfriend and the father of her child stand before a judge facing charges of killing her. Judge Lee Ann Roads entered a not guilty plea for Ronald James Corbin -- standard for the first appearance on a recent indictment. But the moment that brought him to court is far from recent. More than six years ago, he shot and killed his girlfriend Genna Ayup. He'd had four large beers. He said the gun went off by accident as he was changing the hand grips. Her family and friends could not believe it when he escaped charges at the time. Steve Kozachik was part of a push by Tucson City Council for a city ordinance to require alcohol tests after gun incidents. He says a chance meeting with Genna's sister led him to take a fresh look at the case. After he met with her parents, Kozachik and his chief of staff took their own look at police records and organized records they found scattered and inconsistent into a well-focused case. 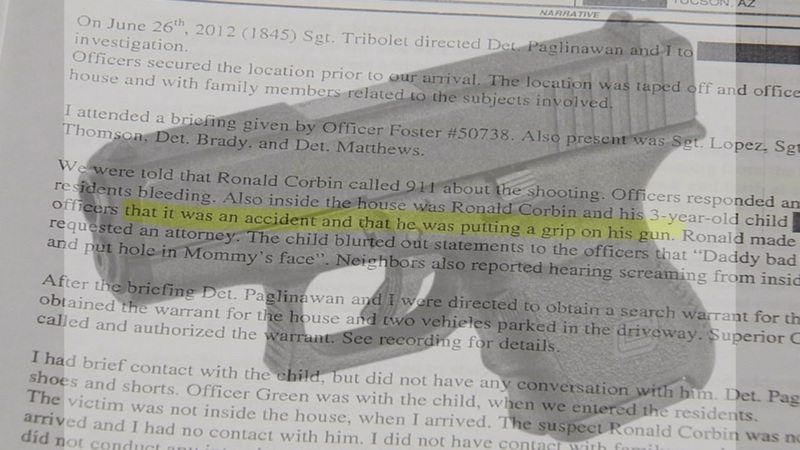 They got a private investigator involved and convinced police and prosecutors to charge Ronald Corbin with deliberate manslaughter. In a joint statement from the family, Kozachik says, in part, "We are committed to honoring our love of Genna, and will do so by trusting that the facts will guide the system to the proper and just result." Now it's up to a trial to decide if Ronald James Corbin is guilty of deliberately killing Genna Ayup. If he is convicted he could face more than 12 years in prison.